Located on a hill in the middle of the Polverino forest, facing south, the farm spans approximately 20 hectares, 6 of which are olive grown. The 1150 centuries old olive trees, which were originally in a state of abandon, have been reclaimed and are now farmed organically. 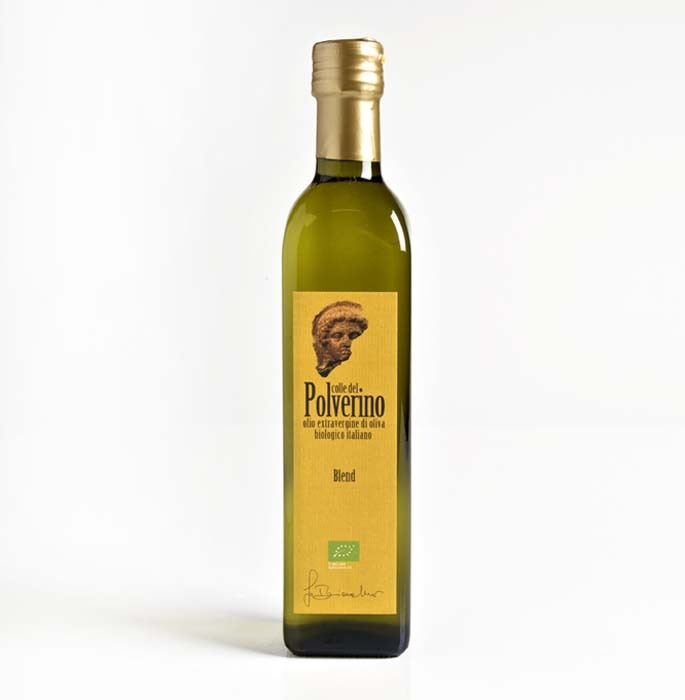 The oil is made exclusively from olives grown on the farm, which are harvested at the proper ripening stage and crushed within 24 hours in an organic mill without using a centrifugal separator; processing temperatures never exceed 27°c, in compliance with cold extraction standards. Of medium intensity it is an intense limpid golden yellow color with warm green hues. Its aroma is tomato and artichoke, with fruit hints of average maturity and fragrant hints of basil and field balm. Its taste is elegant and vegetal, with a flavour of counry vegetables, broad beans, celeri and sweet almond finish. Bitterness and pugency are present and harmonic. It would be ideal on bean starters, salmon carpaccio chicken salads, marinated fish, mushroom soup, mushroom salad, first courses with vegetables, stewed shellfish, grilled fish, baked and grilled meat, pasta filata fresh cheese.